Illusionist Zak Mirzadeh debuts the MIRZ brand. 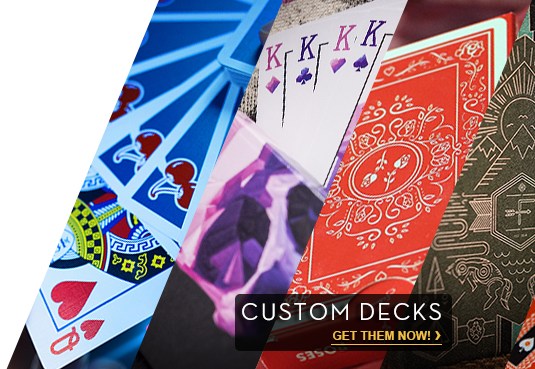 MIRZ Playing Cards launched on Kickstarter and was funded within 24 hours. The pattern on the card back is based on Girih (Persian for "knot"), a decorative geometric artform popular in Middle Eastern countries. Girih is constructed from hexagons placed using an overlapping circle grid, a pattern that dates to the 13th century. The tuck box has this same design wrapped around the bottom with a gradient fade to white, giving a subtle hint to what you will experience when you open the cards. The MIRZ symbol is featured on the back of the tuck box, while the top has the suits in CHASED (Clubs, Hearts, Spades, Diamonds) order. Only 2,500 decks printed. No reprints.